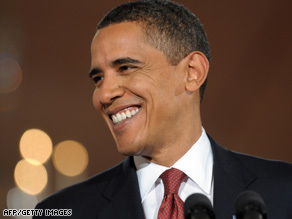 WASHINGTON (CNN) -- A new national poll suggests that President Obama is personally more popular than his policies. Three in four Americans say President Obama has the personal qualities a president should have, the poll shows. The CNN/Opinion Research Corp. poll, released Monday, also indicates that 63 percent of Americans approve of how Obama is handling his duties as president. One in three questioned in the poll disapprove. Democrats overwhelmingly approve of how Obama is handling his job as president; 61 percent of independents agree. Only 28 percent of Republicans say the president is doing a good job in office. The survey, released two days before Obama marks 100 days in the White House, indicates that three in four Americans feel Obama has the personal qualities a president should have. But when asked whether Obama agrees with the respondent on the issues, that number drops to 57 percent. "Americans have two different assessments of President Obama. One, personal. The other, policy," CNN Senior Political Analyst Bill Schneider said. "What does the public find most controversial about President Obama? His policies, much more than his personal qualities." "Now that Obama is president, the number who agree with his views on the issues has gone down, while the number who say he has the right personal qualities has gone up," CNN Polling Director Keating Holland added. "That didn't happen the last time we had a new administration. In George W. Bush's first months in office, the number who thought he had the right personal skills to be president was lower than the number who felt that way during the 2000 presidential campaign." The CNN/Opinion Research Corp. poll was conducted Thursday through Sunday, with 2,019 adult Americans questioned by telephone. The survey's sampling error is plus or minus 2 percentage points.